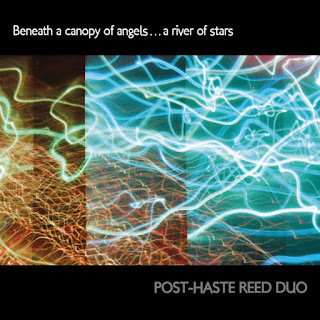 The Post-Haste Reed Duo consists of two talented reedists--Sean Fredenburg on soprano, alto and tenor saxophones, and Javier Rodriguez on bassoon. They tackle heroically and effectively five mostly very new works for bassoon and saxophone, some with the addition of electronics, for a program that exemplifies what a contemporary chamber sonance can be right now. All this on their CD Beneath A Canopy of Angels...A River of Stars (Aerocade Music AM002). Five composers and their works share the spotlight. for an "anything goes" postmodernism that can be tonal or less so, appropriative or pure, virtuoso oriented or relatively plain-spoken, with each following its muse creatively and intriguingly. Simon Hutchinson begins the program with "bioMechanics" (2011), a dramatic, nearly symphonic modernist aural essay with electronics filling out the reed parts for a grand gesture of episodic sound that pulsates at times in a very contemporary way. Louis Andriessen and his "Lacrimosa" (1991) is arranged for alto and bassoon by Jeff Chambers. (It was originally for two bassoons.) Based on verse 18 from "Dies Irae," it utilizes microtones as it explores an evocative musical interpretation of the verse. Ethan Wickman's three-movement "Confluences" (2014) pits alto and bassoon in a series of convergences--of specific performance spaces, of register-color and of motive. Lanier Sammons contributes a six-movement "Some Thoughts About Time" (2012), a series of short configurations for the reeds and sometimes electronics to explore in sound various musico-temporal theories espoused by musicologists, psychologists, aestheticians and composers. Finally, John Steinmetz gives us a four-part "Songs and Dances" (2013), drawing upon a figure from a Bach Cantata, West African processional drums, an American folk song and a pop tune for special transformative treatment that has a quasi-neo-classical jauntiness oftimes. 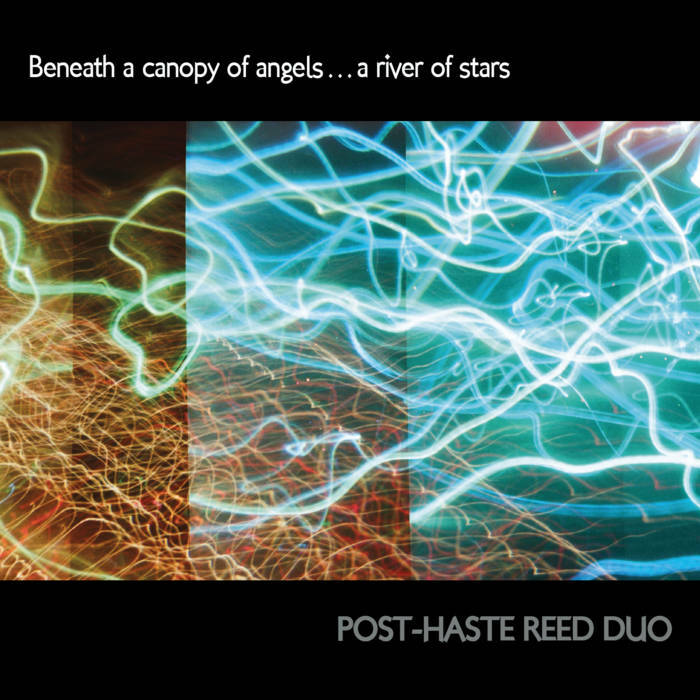 Throughout the Post-Haste Reed Duo show us an admirable musical poeticism and a supreme command of their instruments for a very lively and absorbing program of where chamber music can be in our times. Highly recommended.